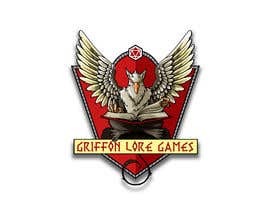 The Griffon Lore Games logo is for a fantasy role-playing games press. As a publisher of premium role-playing books (hardback and in color) and PDFs, Griffon Lore Games needs a color logo that encapsulates the depth and feeling of our products. The logo needs to contain a Griffon imposed or incorporated in a presentation similar to medieval coat-of-arms with a clear, sharp font for the words "Griffon Lore Games". While coat-of-arms like, it should not be an actual coat of arms. The logo should be distinctive, artistic and creative. As the logo for products rich in original content, it should not have a corporate or big-business feel, but rather an expression of artistry and elegance. A logo that encapsulates the fantasy-genre concepts of “griffon” and “lore” (either separately or “griffon lore” as a singular concept) will be the winner. “Games” is implied and does need any association to the logo as a graphical element (although the words Griffon Lore Games needs to be associated with the logo). 1) The logo with the Photoshop or Illustrator (or like standard format) file for later manipulation in the non-compressed minimum resolution of 300 DPI. 2) The full logo in a *non-compressed* JPG, TIF or PNG format, minimum 300 DPI, suitable for high-quality printing. 3) The full logo in in 72 DPI for webpages and social media. 5) The logo without any words as a JPG, TIF or PNG in the minimum resolution of 300 DPI for the book spine. Thank you very much. Please do not hesitate to contact us with questions. The winners might have more business from us when we need banners and text separators for inside the book(s) or PDF. Thanks everyone, contest is over. We had two clear 5-star entries and of those, the winner encapsulated the role-playing game/lore concept. hlo sir i done the work,, how can i submit you my design ..kindly let me know sir.. thank you sir..
Just over two days remaining in the contest. If you haven't entered yet, you should plan to do so soon! Working on it almost done! 1) The entry contained no griffon: reject. 2) You phoned it in: you're using the stock version of a griffon graphic that must exist somewhere on Google image search that 6+ other Freelancers are: reject. 3) Your logo submission had a corporate look with no creativity or artistry: reject. Out of all the entries, only ONE incorporated the concepts of the Fantasy Griffon AND Lore. IF YOUR LOGO did one of the three things above. Revise. Take your time. Resend. IF YOU ARE SUBMITTING YOUR LOGO and do one of the three things above: Don't submit. We'll click Reject and never look at it again. IF YOU WANT TO WIN: A logo that encapsulates the fantasy-genre concepts of “griffon” and “lore” (either separately or “griffon lore” as a singular concept) will be the winner. Do you have some product examples to design the new logo matching to what you are offer. Or do you want special free art according to your briefing without direct product inspiration? This is wide open. We're a creative content publishing house for fantasy role-playing games and looking for a creative logo. We're in the business planning stages, and are of the opinion to let the creative and artistic logo designers do what they do best without coloring their input. 1) Some immediate feedback: we are absolutely waiting until the contest ends to pick a winner. Take your time. 2) The logo has to be in color. 3) The logo that is artistic and creative, and not with a corporate look, will win. Please make sure you incorporate the logo vision outlined in the description. This is a logo for a role-playing-fantasy game. Here is fine. Freelancer doesn't like email exchanges for some reason during bidding/contest and often deleted email addys until the contest is over. Where can we contact you? Through here or an email?